The Lhasa apso a relatively small but quite sturdy dog with a long and dense double hair coat. This breed is known to be happy and playful, but also independent and mischievous. They have a history of thousands of years as a tiny guard dog. This breed also excels as a hearing ear dog for people with hearing loss. Coat and Color: Dense double coat can be nearly any color, but are most commonly seen in black, white, gold, gray, cream or a combination of these. The Lhasa apso is originated in Tibet over 2,500 years ago and evolved perfectly for the harsh climate of the Himalayas. Named for the sacred city of Lhasa, these prized creatures were the indoor watchdogs of temples and palaces. They have highly developed hearing and would alert the monks if anybody got past the exterior guard dogs. In Tibet, the breed is called the apso seng kye or "bark lion sentinel dog." This long history as a guard dog contributes to the modern breed's personality. DNA evidence shows that the Lhasa apso is an ancient line closely related to the wolf that is the ancestor of all dogs. Lhasa apsos given as gifts by the Dalai Lama to Chinese nobles are believed to have contributed to the bloodlines of the Shih Tzu and Pekingese dogs. The Lhasa apso gradually came into the Western world in the early 1900s and was recognized as the "Lhasa terrier, 10-inch type" by the Kennel Club in London in 1908. However, World War 1 had a quelling effect on breeding. In the 1930's, Lhasas were given as a gift from the Dalai Lama to American C. Suydam Cutting, a world traveler, and naturalist. The breed was recognized by the American Kennel Club (AKC) in 1935 as the Lhasa terrier but was re-named Lhasa apso in 1944. In 1959, the breed was moved from the terrier group to the non-sporting group. Many owners choose to keep their Lhasa's hair trimmed in a short "puppy coat." Others, especially those in the show world, prefer the natural long and heavy coat. Either way, a strict grooming routine is an absolute necessity. The Lhasa's hair grows constantly, so haircuts will be needed. Those who keep the coat short will need to have the hair trimmed every two to three weeks and brush the hair every seven to 10 days. If the hair is kept long, thorough brushing is vital every one to two days. The Lhasa is called a hypoallergenic dog breed due to the way it sheds. While the allergens that trigger dog allergies are contained in the skin cells (dander) and saliva rather than the hair itself, they are more likely to become airborne if a dog sheds lots of lightweight hair. The Lhasa's hair is heavy and coarse and sheds continuously, which is said to result in fewer airborne dog allergens. While the way in which individuals are affected by a dog allergy may vary, this breed may be suitable for those who are mildly or moderately allergic to dogs. The Lhasa has a mind of its own and a strong-willed nature. Because of this, training is an absolute requirement. However, this breed is quite smart and can learn well with persistence. Proper socialization is also important so your Lhasa will be comfortable in all kinds of situations. They are naturally protective and reserved around new people. The Lhasa has a medium energy level and does not need a tremendous amount of exercise. 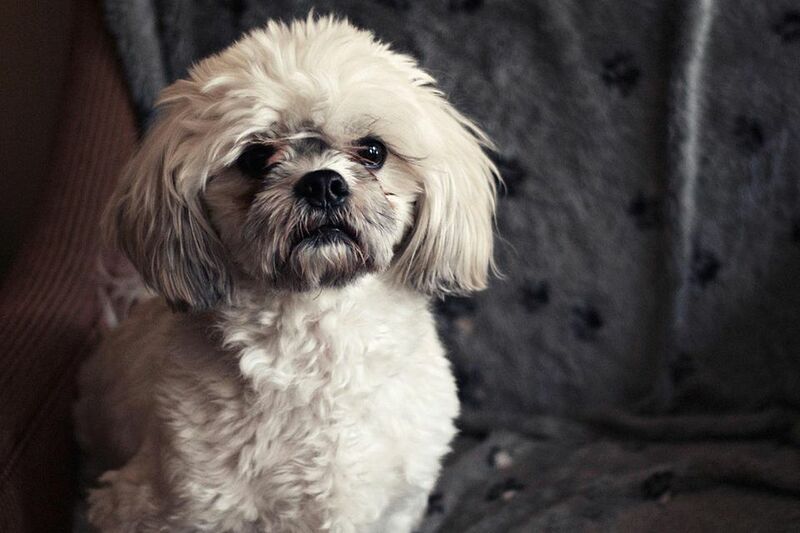 However, daily walks and fun activities like games can help keep your Lhasa mentally and physically stimulated. The Lhasa's small size makes this breed ideal for apartments and small homes. They are not prone to separation anxiety and do well in households where you are gone during the workday. However, they can be annoying barkers as they are hard-wired to bark at any passerby or concerning noise. This breed may not be an ideal first choice for households with children, but it can get along with some kids if raised with them and well-trained and socialized. They won't put up with teasing or mishandling. This is an intelligent and protective breed that will bond closely with its owner, but also a playful and mischievous dog. Your Lhasa will need two meals a day of up to half a cup of dry dog food per meal. The amount will vary with the size, age, and activity level of your pet. A dog's nutritional needs change over time. You need to monitor your dog's weight and ensure he hasn't put on any extra as even one pound is a significant weight gain for a tiny dog. Obesity will shorten your dog's lifespan. Discuss any needed diet changes with your veterinarian to get recommendations for a feeding schedule, amount, type of food, and exercise. It's best not to leave out food for free-feeding or to give in and feed your dog human food as a treat. The American Lhasa Apso Club is a great place to start your search for a dog; their extensive list of breeders features icons to indicate breeders with available puppies. If you are interested in a Lhasa rescue, the AKC recommends LhasaApsoRescue.org. As with any breed, if you think the Lhasa apso is the right dog for you, be sure to do plenty of research before adopting one. Talk to other Lhasa owners, reputable breeders, and rescue groups to learn more. There’s a whole world of dog breeds out there. With a little research, you can find the right one to bring home.